Founded 1865 by Capt. John Turpin, CSA (NC)-POW Non-denominational until 1885. Became Turpin's Chapel MEC (South) 1885. Name changed to Maple Grove MEC (South) 1912. Became Maple Grove Methodist Church 1949 and Maple Grove United Methodist Church 1968. Also the site of the first church in Haywood County (Baptist-ca. 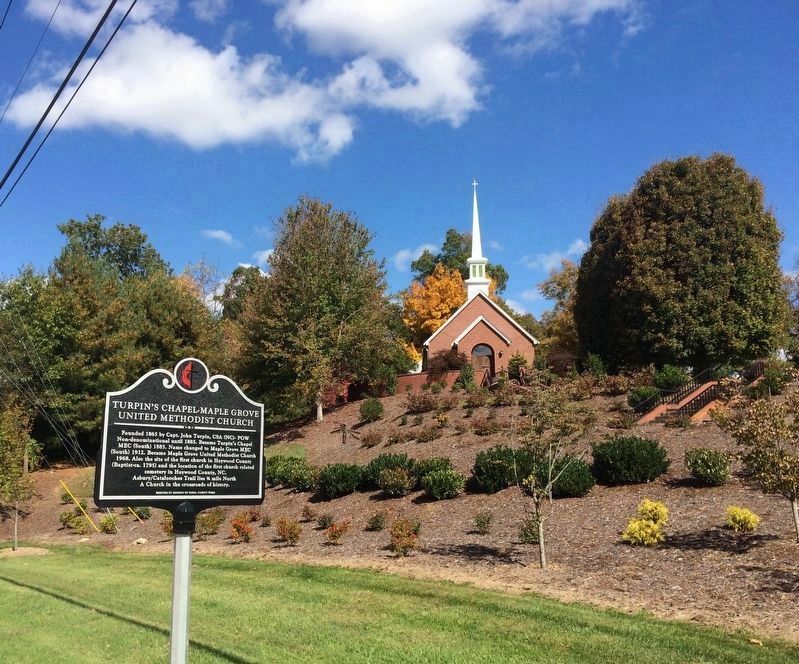 1795) and the location of the first church related cemetery in Haywood County, NC. A Church in the crossroads of history. Location. 35° 31.088′ N, 82° 59.254′ W. Marker is near Waynesville, North Carolina, in Haywood County. Marker is at the intersection of Russ Avenue (U.S. 276) and Maple Grove Church Road, on the right when traveling north on Russ Avenue. Touch for map. 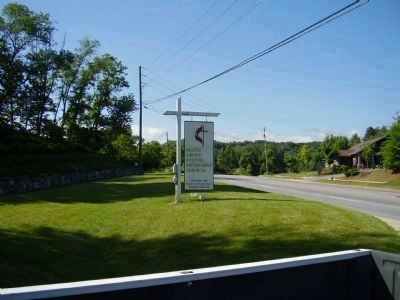 Marker is at or near this postal address: 1970 Russ Avenue, Waynesville NC 28786, United States of America. Touch for directions. 2. 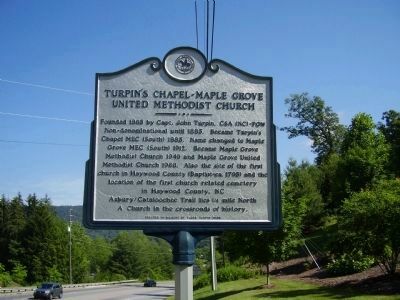 Former marker named "Turpin's Chapel - Maple Grove United Methodist Church"
(approx. 1.2 miles away); N.C. Education Association (approx. 1.8 miles away); Old Time Music (approx. 1.9 miles away); Battle House (approx. 2 miles away); Martin's Surrender (approx. 2.2 miles away); Waynesville Engagement (approx. 2.2 miles away). Touch for a list and map of all markers in Waynesville. 3. 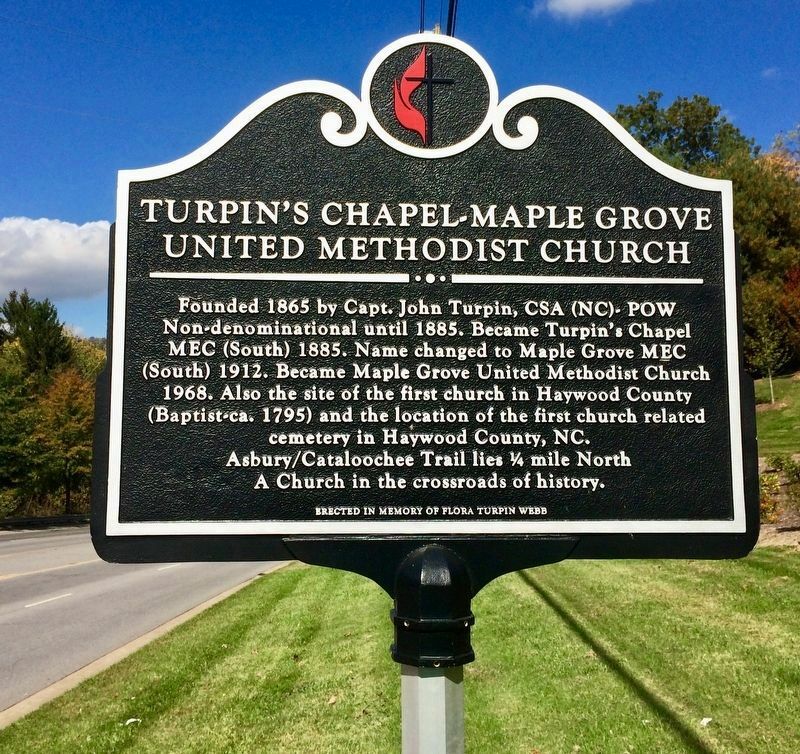 Turpin's Chapel - Maple Grove United Methodist Church & replacement marker. 6. 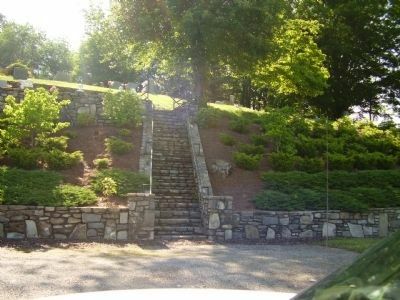 Maple Grove Methodist Church Cemetery (Also known as: Turpins Chapel Cemetery) on hill. 7. 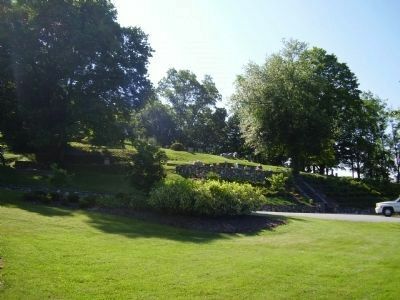 Maple Grove Methodist Church Cemetery (Also known as: Turpins Chapel Cemetery) on hill. More. 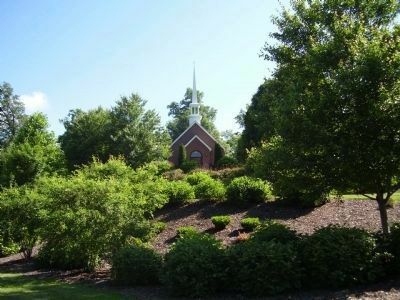 Search the internet for Turpin's Chapel - Maple Grove United Methodist Church. Credits. This page was last revised on October 21, 2016. This page originally submitted on June 7, 2009, by Stanley and Terrie Howard of Greer, South Carolina. This page has been viewed 1,476 times since then and 12 times this year. Photos: 1. submitted on October 20, 2016, by Mark Hilton of Montgomery, Alabama. 2. submitted on June 7, 2009, by Stanley and Terrie Howard of Greer, South Carolina. 3. submitted on October 20, 2016, by Mark Hilton of Montgomery, Alabama. 4, 5, 6, 7. submitted on June 7, 2009, by Stanley and Terrie Howard of Greer, South Carolina. • Syd Whittle was the editor who published this page.